How the family justice system works changed in April 2014, but separating parents are still unsure how to go about resolving their disputes over the care of their children. They may not know that going to the Family Court should be their last resort and that there are other services available to help them agree on the care of their children. Free parenting through separation courses are available to help you think about what your children need. The course takes 4 hours, usually done in two sessions of 2 hours each. Any separating parent can go to one of the courses. If the parents can’t agree about how their children will be cared for, they can attend mediation through Family Dispute Resolution (FDR). While it’s not free – except for low income partners – it is generally cheaper than going to court. Except in cases of domestic violence – going to Family Dispute Resolution is generally a pre-requisite to going to the Family Court, and most disputes are settled by the time the parents have completed this step. We can help you to navigate the process. At the bureau we have booklets to help you make a parenting plan. We can help you find a relationship counselor, a parenting through separation course or an FDR mediator. We can also help you work out whether you are eligible for funding, which allows you to receive – for free – FDR mediation as well as four hours of free legal help from a Family legal Advice lawyer. Come and see us. We also have information about parenting after separation and child support on our website www.cab.org.nz. Citizens Advice Bureaux is an independent community organisation offering a free, confidential and independent service of information, assistance and referral from 83 locations stretching from Northland to Invercargill. Last year volunteers received over 500,000 enquiries on issues ranging from health and family, electricity, immigration, housing and employment to consumer rights. 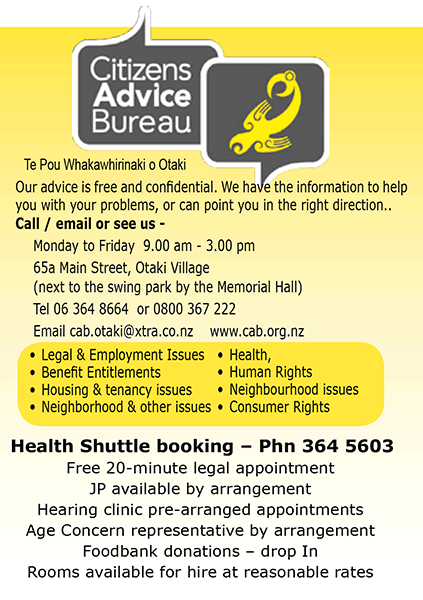 Te Pou Whakawhirinaki o Otaki Our advice is free and confidential. We have the information to help you with your problems, or can point you in the right direction.